MegaMatcher Extended Accelerator 3.0 is a solution for fast template matching on server-side part of a large-scale AFIS or multi-biometric system. The Extended version includes software for fast biometric template matching on server-side part of a large-scale AFIS or multi-modal system. MegaMatcher Accelerator Extended units and MegaMatcher Accelerator Standard software can be purchased by new and existing MegaMatcher SDK, VeriFinger SDK and VeriEye SDK customers. or as biometric software for running on a common PC. Up to 200,000,000 irises or 100,000,000 fingerprints per second matching speed on a single unit. Fingerprint, iris and face modalities supported. ISO & ANSI fingerprint template standards support. Evaluation. Fulcrum Biometrics can provide access to MegaMatcher Accelerator Standard or Extended units running at remote locations for evaluation purposes. Please contact us for more information. Cluster of MegaMatcher Accelerator Standard or Extended units . The charts below compare the different architectures for high performance AFIS or multi-biometric systems. Matches 160,000 fingerprints or 1,200,000 faces or 1,440,000 irises per second. Requires MegaMatcher Standard SDK. Matches up to several millions fingerprints or faces or irises per second. Requires MegaMatcher Extended SDK. Matches 35,000,000 fingerprints or 70,000,000 irises per second. Requires MegaMatcher 7.x SDK, VeriFinger 6.3 SDK or VeriEye 2.3 SDK for client application development and 1 MegaMatcher Accelerator 3.0 Standard software installation. Matches from 70,000,000 to 350,000,000 fingerprints or from 140,000,000 to 700,000,000 irises per second. Requires MegaMatcher 7.x SDK, VeriFinger 6.3 SDK or VeriEye 2.3 SDK for client application development and multiple MegaMatcher Accelerator 3.0 Standard software installations for reaching the required performance. Matches 100,000,000 fingerprints or 200,000,000 irises per second. Requires MegaMatcher 7.x SDK, VeriFinger 6.3 SDK or VeriEye 2.3 SDK for client application development and 1 MegaMatcher Accelerator 3.0 Extended unit. Matches from 200,000,000 to several billions fingerprints or from 400,000,000 to several billions irises per second. Requires MegaMatcher 7.x SDK, VeriFinger 6.3 SDK or VeriEye 2.3 SDK for client application development and multiple MegaMatcher Accelerator 3.0 Extended units for reaching the required performance. It is possible to use more than one architecture within a large-scale biometric system to reach optimal system performance and/or availability. For example, MegaMatcher Accelerator unit(s) can be used for candidates selection using irises or several fingerprints, and then the results can be validated on Matching Server or Cluster with other biometric modalities. 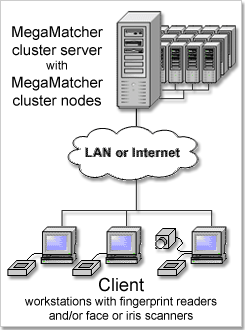 Also, two or more Clusters Servers or MegaMatcher Accelerator 3.0 clusters can be connected together for high availability system. The architecture with a single Matching Server is intended to be used in moderate size systems like local AFIS or multi-biometric system which do not have strict requirements on performance or availability. The Matching Server software is available in MegaMatcher 7.x Standard and Extended SDKs, as well as in VeriFinger 6.3 Extended SDK, VeriLook 5.0 Extended SDK and VeriEye 2.3 Extended SDK. A PC running Matching Server software accepts identification requests from client-side components for fingerprint, face and/or iris biometrics and returns back the identification results. Up to 160,000 fingerprints or 1,200,000 faces or 1,440,000 irises per second can be matched on single Matching Server (on Intel Core2 processor with 4 cores running at 2.66 GHz). The Matching Server can be also used for multi-biometric systems that use any combination of these biometric modalities: fingerprints, faces and/or irises. This architecture is designed for high productivity AFIS or multi-biometric system with millions of biometric templates stored in the database. The Cluster Server component is available in MegaMatcher Extended SDK. Cluster Server distributes identification task over computers connected to the network. A biometric system based on Cluster Server software can be scaled up anytime to meet changing project requirements in increasing user amount or request environment. The cluster software consists of a Cluster Server and software for cluster nodes that run fingerprint, face and/or iris components. The Cluster Server accepts requests from client side, manages cluster work, distributes tasks over cluster nodes, collects results, reports them back to client side. Also it communicates with the main database which stores the biometric data. Each cluster node matches up to 160,000 fingerprints or 1,200,000 faces or 1,440,000 irises per second (on Intel Core2 processor with 4 cores running at 2.66 GHz). The Cluster Server can be also used for multi-biometric systems that use any combination of these biometric modalities: fingerprints, faces and/or irises. A cluster node contains part of the main database, performs identification tasks in it and reports results to the Cluster Server. The node must have enough memory to store that database part, as all data is kept in memory during identification to achieve the best matching speed. 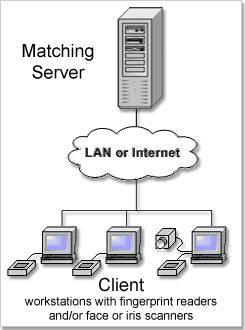 A larger number of nodes results in faster matching, because each node operates on a smaller part of the database. The cluster node uses database to store its database part and in order to perform relational queries, such as filter persons by gender, age, living place. The whole database should fit into nodes memory (RAM). For example, if there are 10GB of biometric data and each node has 2GB of free memory available, at least 5 nodes should be used as otherwise the database will not fit into nodes memory and the cluster will not work. The identification speed should satisfy project requirements. The speed requirements may be defined indirectly via identification request response time and/or peak hour request quantity with a given database. Response time. For example, a database stores biometric data for 1 million people with 2 fingerprints for each of them, and the response time for an identification request should be 1 second. At least 13 cluster nodes should be used to provide the required response time. Peak hour request quantity. For example, the project with the same database as above requires to process 5,000 identification requests at the peak hour. At least 18 cluster nodes should be used to provide the required peak hour availability. Spare nodes (enabled by default). A spare node "waits" until an operating node fails and is used to replace the failed one by copying the part of database that was used in the failed node. If the failed node restored, it become the spare node. Re-split tasks and database over existing nodes. If a node fails, the system finishes all tasks which are not related with the failed node, reinitializes nodes again by re-splitting the database over them and continues tasks passed into cluster. As a result the overall cluster performance decreases but the cluster continues to operate until the failed node is fixed or replaced. Note, that the database re-split is possible only if total amount of memory available in the remaining nodes is larger than the database size. We recommend to leave at least 10%-20% free memory reserve when calculating the amount of used nodes in a cluster for both fault tolerance methods. The memory reserve would allow to avoid situations when the system can not continue work as it has not enough resourses. MegaMatcher Accelerator Standard is intended for biometric identification projects with up to several million people enrolled in database. This version includes ready-to-use server-side fingerprint and/or iris matching software for installation on a PC with Intel Core i7 processor and 12 GB of RAM. A single MegaMatcher Accelerator Standard unit can store 3,000,000 fingerprints or 6,000,000 irises and matches 35,000,000 fingerprints or 70,000,000 irises per second. MegaMatcher Accelerator Extended is a solution for national-scale biometric identification projects with millions of people enrolled in database. This version includes ready-to-use HP Proliant server hardware with pre-installed OS and fingerprint and/or iris matching software. A single MegaMatcher Accelerator Extended unit can store 30,000,000 fingerprints or 50,000,000 irises and matches 100,000,000 fingerprints or 200,000,000 irises per second. A MegaMatcher Accelerator unit accepts identification requests from PCs that run client-side software based on components for fingerprint, iris or face biometrics, performs identification and returns back the results. MegaMatcher Accelerator can be also used as a part of scalable multi-biometric identification system that uses fingerprint, face and/or iris modalities. The fingerprints and/or irises would be matched using MegaMatcher Accelerator(s), whereas other modalities would be matched using Matching Server or Cluster Server software depending on project size and performance requirements. Also MegaMatcher Accelerator software includes fingerprint, face and iris matching engines that may be used for results validation after fast fingerprint or iris matching inside the Accelerator unit instead of using MegaMatcher Server or Cluster. MegaMatcher Accelerator Standard and Extended versions already include cluster software, thus multiple MegaMatcher Accelerator Standard or Extended units can be connected via network to a cluster. 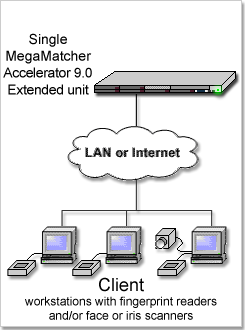 To create a cluster, one MegaMatcher Accelerator unit is assigned as a primary unit in the cluster while other MegaMatcher Accelerator units act as cluster nodes. Note that the primary unit of MegaMatcher Accelerator cluster will still perform fast fingerprint and/or iris matching while using only a small part of its resources for managing the cluster. Each MegaMatcher Accelerator Standard unit in the cluster matches 35 millions fingerprints or 70 millions irises per second, and each MegaMatcher Accelerator Extended unit matches 100 millions fingerprints or 200 millions irises per second. When started, the primary unit splits the whole biometric database, which is stored on its hard disk, and send parts of the database to all MegaMatcher Accelerators in the cluster. Later the primary unit waits for fingerprint and/or iris identification requests from client side, then distributes the identification request to the units of the cluster and returns the identification results to the client side. The cluster of MegaMatcher Accelerators can be scaled up anytime to meet changing project requirements in increasing user amount or request environment. A larger number of MegaMatcher Accelerator units results in faster matching and higher number of requests processed, because each unit operates on a smaller part of the database. The whole database should fit into memory of the MegaMatcher Accelerator units. A single MegaMatcher Accelerator Extended unit stores 30 million fingerprints, thus 2 units required to store the sample 40 million fingerprints database. The response time for an identification request should satisfy project requirements. For example, the project requires receive an answer to an identification request in 1 second. Single MegaMatcher Accelerator Extended unit matches 29 million templates in 4-to-many mode, thus the two units will satisfy the project requirements for response time. The peak hour request quantity should satisfy project requirements. For example, the project expects that there may be up to 30,000 identification requests per hour. Single MegaMatcher Accelerator Extended unit matches 29 million templates in 4-to-many mode, thus it will be able to process 10,440 requests per hour with the sample 10 million template database. Therefore, a cluster of 3 MegaMatcher Accelerator 3.0 Extended units will be required to process the required number of identification requests with the sample database. Spare MegaMatcher Accelerator units. A spare MegaMatcher Accelerator unit "waits" until an operating unit fails and is used replace the failed one. Switching time from "wait" state to "operating" state depends on time required to copy database part used by failed node into spare node. If the failed node restored, it become the spare node. Spare cluster. Two clusters of MegaMatcher Accelerator units can be used to provide higher availability and failover. The clusters should have the same database loaded into each of them. One of the clusters can be used as "spare" and wait, until the "active" one fails and replace it. Switching time is very small even in case of manual switch, as the spare cluster already contains the database. Two parallel clusters. This method also requires to run two clusters of MegaMatcher Accelerator units with the same database loaded into each of them. Both clusters can run in parallel and provide 2 times higher performance. If one cluster fails, the other one will continue operation and provide the nominal performance. Note, that "spare cluster" and "two parallel clusters" methods may require additional software and hardware for building high-availability clusters. MegaMatcher Accelerator Extended is a family of biometric solutions for fast fingerprint and iris matching on server-side part of an AFIS or multi-biometric system. The solutions are intended for national-scale biometric identification projects with millions of people enrolled in database. Fast fingerprint and iris matching engines that can be used separately or together. See technical specifications for engines comparison and licensing model for engines availability. Fingerprint, face and iris matching engines that can be used separately or together to validate matching results produced by the fast fingerprint and/or iris engines. MegaMatcher Accelerator 3.0 Extended software (pre-installed). Multiple MegaMatcher Accelerator Extended units can be combined to reach higher productivity using the included cluster software. Client communication module that allows sending a task to the MegaMatcher Accelerator, querying status of the task, getting the results and removing the task from it, is included with MegaMatcher SDK, VeriFinger 6.3 SDK, VeriLook 5.0 SDK and VeriEye 2.3 SDK. This module hides all low level communications and provides high-level API for the developer. 30,000,000 fingerprint records or 50,000,000 iris records for each MegaMatcher Accelerator 3.0 Extended unit. 3,000,000 fingerprint records or 5,000,000 iris records for each PC that runs MegaMatcher Accelerator Standard software. If a biometric template contains several fingerprint and/or iris records, the database storage capacity changes proprtionally. The table below shows storage capacities for some combinations of fingerprints and/or irises records; there are no limitations on the quantity of fingerprint or iris records in a template. Please contact us to help you determine how many MegaMatcher Accelerators would be required for a specific project. 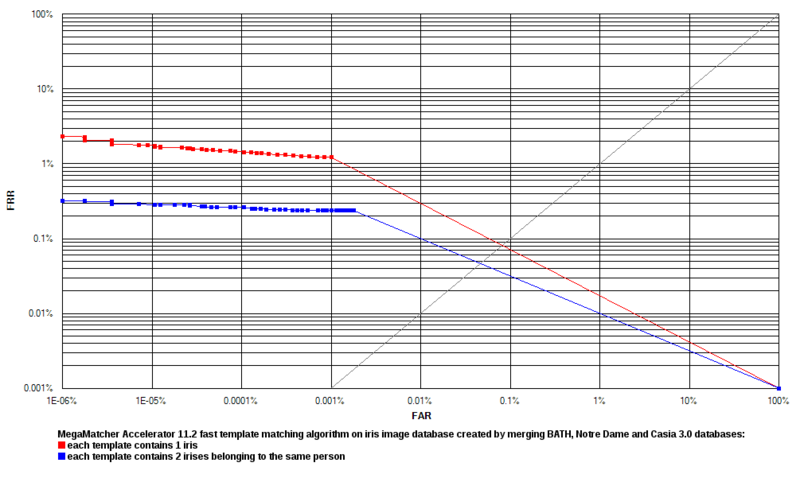 The tables below show the performance of MegaMatcher Accelerator 3.0 fast fingerprint and iris matching engines performance on the specified hardware. MegaMatcher Accelerator 3.0 Extended was tested on the specified server hardware. 10 fingerprint records – using all 10 fingerprints belonging to the same person. 2 iris records – using both eyes iris images belonging to the same person. 4 fingerprints + 2 iris records belonging to the same person. 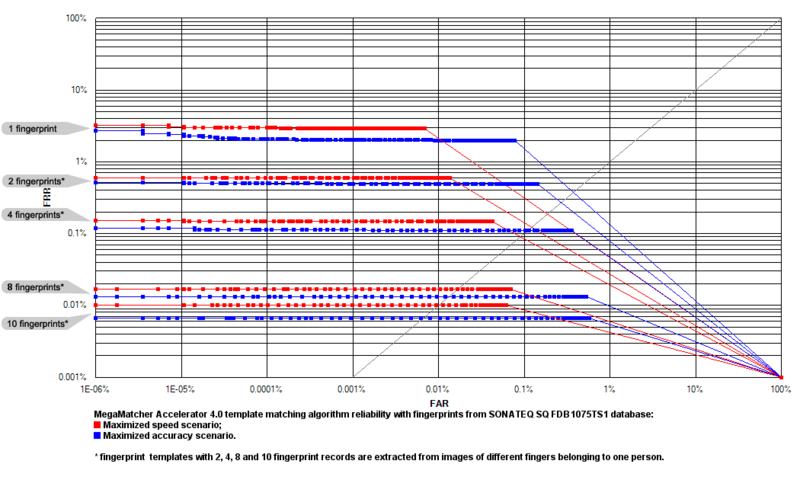 Reliability testing results for the MegaMatcher Accelerator 3.0 fingerprint template matching algorithm are shown as a receiver operation characteristics ( ROC) charts. 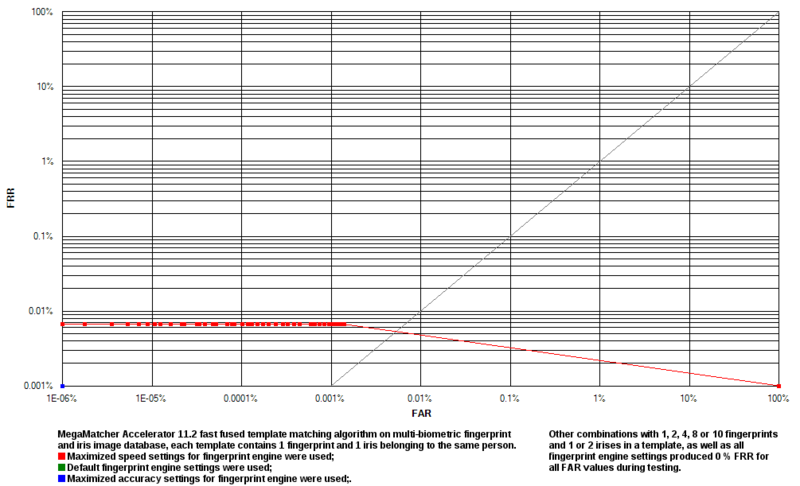 Note, that all tests with Database 3, except 1 finger + 1 iris, produced 0% FRR for all FAR values. MegaMatcher Extended Accelerator requires a pre-configured HP Proliant Server Platform. All requirements are taken care of in the custom server implementation. Customers simply take delivery of the server after purchasing it. Fulcrum Biometrics and Neurotechnology provide free and unlimited technical support for MegaMatcher Accelerator over phone or email. Technical support covers issue resolution, bug fixing and providing the required technical information. MegaMatcher Accelerator Extended is ready-to-use software solution for fast multi-biometric identification software. The solution does not require any additional development and accepts requests from client software via network or Web. Fast matching. A single MegaMatcher Accelerator Extended unit can match up to 100 million fingerprints per second or up to 200 million irises per second in 1-to-many mode using Neurotechnology proprietary biometric template format. Multiple modalities support. MegaMatcher Accelerator can be used within a biometric system that contains templates with any number of fingerprint, iris and/or face records. Full database search. The biometric engines included in MegaMatcher Accelerator do not perform internal database indexing or pre-classification (by fingerprint type, eye color etc) thus avoiding false rejections when incorrect classificators appear. This way the whole database is scanned comprehensively during every matching request and very low false rejection ensured. On the other hand, integrators may use non-biometric classificators like gender or country's region to optimize system size. Optimal system size. A system based on MegaMatcher Accelerator solution can be configured to perform fast candidates selection using irises and/or several fingerprints, and then use other biometric modalities to validate selection results. This approach allows to reach optimal matching speed and reliability while keeping the overall system cost within the defined limits. ISO & ANSI standards support. MegaMatcher Accelerator allows to use ANSI and ISO biometric standards for fingerprint templates. Scalable architecture. 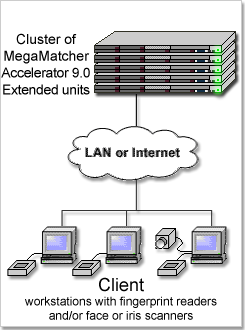 Multiple MegaMatcher Accelerator units can be combined together in a cluster for higher matching speed. For example, a cluster of 5 MegaMatcher Accelerator Extended units would allow to match about 145 million templates per second (when a template contains 4 fingerprint records), a cluster of 10 units – about 290 million templates per second, and so on. 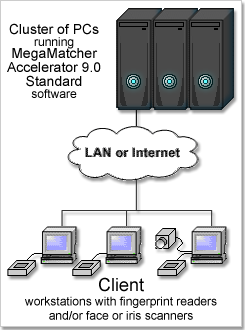 No additional cluster software is required, as MegaMatcher Accelerator includes all necessary software. The customers only need to assign one MegaMatcher Accelerator unit as a primary unit in a cluster. Suitable for duplicates search. Searching for duplicates in a biometric templates database is a task that requires many computations, as each biometric template needs to be verified with each other template in the database. MegaMatcher Accelerator provides enough productivity to complete duplicate searching in a reasonable time. Scalable architecture allows the combination of several MegaMatcher Accelerator units for tasks involving bigger databases.